Richard Painter (AB Harvard, JD Yale) is a widely-recognized expert on corporate, legal, and government ethics. Richard will speak on "Government Ethics in the Age of Trump". Sign-up deadline June 25. 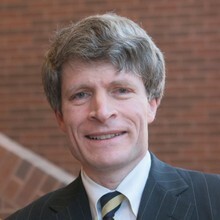 Richard Painter is currently the S. Walter Richey Professor of Corporate Law at the University of Minnesota Law School. From February 2005 to July 2007, he was associate counsel to the president in the White House Counsel’s office, serving as the chief ethics lawyer for the president, White House employees, and senior nominees to Senate-confirmed positions in the executive branch. He has been active in the Professional Responsibility Section of the American Bar Association. He is a former board member and vice chair of Citizens for Responsibility and Ethics in Washington and a founding board member of Take Back our Republic, a campaign finance reform organization. Painter’s books include Getting the Government America Deserves: How Ethics Reform Can Make a Difference, Better Bankers, Better Banks: Promoting Good Business Through Contractual Commitment (with Professor Claire Hill), and Taxation only with Representation: The Conservative Conscience and Campaign Finance Reform. He has written op-eds on government ethics for various publications, including the New York Times, Washington Post and Los Angeles Times, and he has been interviewed several times on government ethics and corporate ethics by national news organizations, including appearances on The Last Word with Lawrence O’Donnell (MSNBC), Anderson Cooper 360 (CNN), CNN News, Fox News, National Public Radio’s All Things Considered, and Minnesota Public Radio News. Prof. Painter is currently running for the U.S. Senate seat held by Tina Smith. His remarks will focus on these abiding ethics issues rather than the Senate race. The Harvard Club of Minnesota does not make political endorsements.